They're all mad, obviously, but mad in a nice way. It's part of what makes the London Marathon such an extraordinary experience. Mind you, this was quite a sight to see at about mile 15. 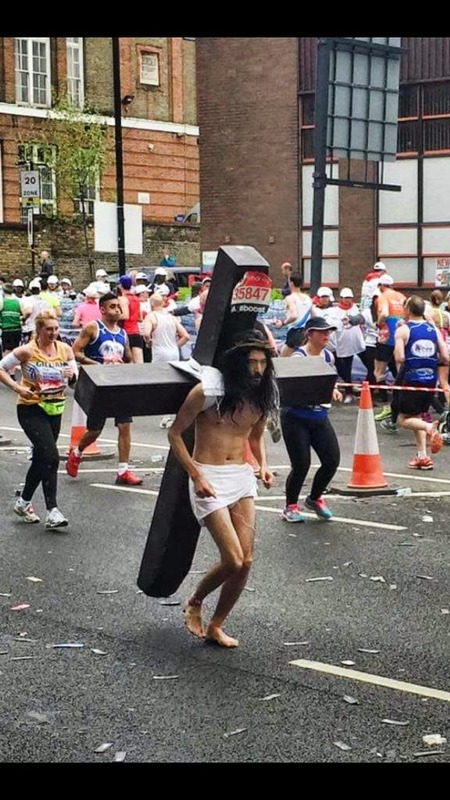 The cross wasn't made of wood, but had already made his back bleed with a full ten miles to go before he finished.... and bare feet? In London? I'm not sure if he was running for a charity, but he did have a sign on the crucifix saying that he was pro-peace and anti-racism, which is good. He took up some road space anyway - it seemed to take an age to run around him. I'm told that, if we raise more than £1000 for our chosen charity at work, then I will be running the Robin Hood half marathon in fancy dress. Super Heroes, probably.... So that's something to look forward to, eh? When I crossed the finish line on Sunday, I was fairly convinced that my body was giving me clear signals that it isn't really built to run 26.2 miles. When someone at running club asked me on Monday evening if I would run another, they told me that my fractional pause before answering told them everything they needed to know. Three days after crossing the finish line, and I rather irritatingly find myself wondering what kind of time I could manage if I was to run one on my own. I went for a sports massage this evening. I've been a few times during training, and I've had some great chats with Pete the masseuse about running. He's done quite a lot in his time, this week revealing that he'd run the Bangkok marathon and the Siem Riep half marathon (hot, apparently). As I paid up this evening, he looked me up and down and told me that he reckoned that I was the type who wouldn't be happy with just the one marathon. Good job on the marathon finish! My dad used to run marathons (before he was diagnosed with Chronic Fatigue Syndrome). He has run pretty much every marathon that existed in the 80s in the Midwest US, as well as Boston. Having witnessed how much running a marathon took out of him, I vowed to never run one myself. I just didn't see the point. I have bicycled a few 100 milers, though. After the first time I finished one, my brother asked how I felt. I replied, "Great, I feel like I could ride another 100 miles!" I need to get back to exercising, but I'm pretty sure running is out for me. At least, for now. Keep up the running! I enjoy reading about your running adventures.